Since a young age, Rebecca Power has had a passion for sports and fitness. It certainly helped that her father, Austin Power, is the girls’ head junior varsity and varsity track coach at Archbishop Molloy H.S., Briarwood. Being around sports for so long, she knew she wanted to turn that passion into a career. So now she’s a certified personal trainer of all athletes, including those who have physical and developmental disabilities. She founded her company, Fitness with Becca, almost a year ago. She specializes in creating fitness and nutrition programs tailored to an individual’s interests to help that person achieve overall health and wellness. At Molloy, Power was a two-sport athlete and team captain in volleyball and track and field. She was named First Team All-Queens as an outside hitter in volleyball in 2007 and racked up numerous track and field honors in her four years. With her father’s guidance, she was a five-time national championship qualifier in pole vault and an 11-time N.Y. state qualifier in shot put and pole vault. She won 13 diocesan individual titles and 11 intersectional individual titles. Until recently, she was the GCHSAA record holder with an 11’1” pole vault. This past spring, she was inducted into the GCHSAA Hall of Fame. After graduating Molloy in 2008, Power continued her athletic career at the State University at Albany, N.Y., where she received a bachelor’s degree in sociology. She competed in pole vault and javelin and was a perennial America East Conference championship scorer. She still holds the school records in those two events. Power married her college teammate Stephen Hassard, and they have a soon-to-be 1-year-old daughter Aayla. Right around the time of her daughter’s birth was when she began her personal training business. Upon graduating college in 2012, Power spent a year in Cleveland working for the Jesuit Volunteer Corps as a health and wellness coordinator. This was the first time she had worked with the special needs population and saw that as a possible career path. She returned to New York as an assistant coach for Molloy’s junior varsity and varsity volleyball teams. Through one of the other assistants, she started working for a program that helps individuals with special needs live a more independent life. As she was doing this work, she noticed that many of the people in the program were not physically fit and did not exercise on a regular basis. She therefore began incorporating aspects of physical activity into her clients’ routines. 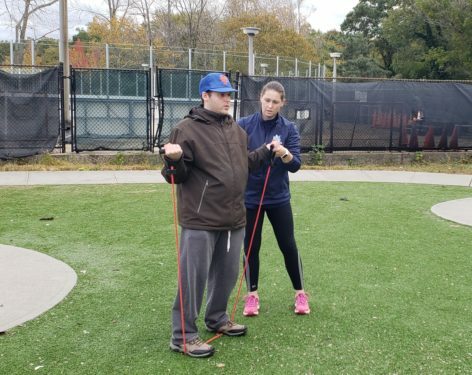 Through Fitness with Becca, Power works with young adults primarily from ages 25-35 in Nassau and Suffolk Counties on Long Island. She creates fitness plans geared toward both an individual’s physical abilities and personality to ensure her clients enjoy exercising and make it a part of their lives. Power said she is grateful for the process of how everything with her company fell right into place. Sometimes not having a plan can actually lead to something special. To inquire about her services, contact her by email at fitnesswithbecca@gmail.com. By offering these meaningful services, Power continues to spend every day turning her passion into her livelihood. This Hall-of-Fame athlete is doing Hall-of-Fame work.